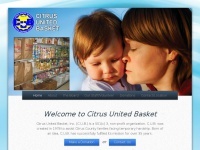 Citrus United Basket is a Citrus County Florida Non-Profit Organization in Partnership with the United Way. We are a Clothing and Food Charity. 29th Parallel Design (http://www.29thparalleldesign.com) is specified as the websites creator. A profile of Citrusunitedbasketonline.org was found on the social network Facebook. The web server with the IP-address 108.163.201.234 used by Citrusunitedbasketonline.org is owned by SingleHop and is located in Chicago, USA. 69 other websites are located on this web server. Most of them are provided in the english language. The websites of Citrusunitedbasketonline.org are served by a Apache server. The HTML pages were created with the latest standard HTML 5. The website does not specify details about the inclusion of its content in search engines. For this reason the content will be included by search engines.